Zune Software lets you play and organize media on your PC, browse Zune Marketplace, share music throughout your home, and sync to your Zune device. Your music, pictures, videos and podcasts take center stage. The streamlined design makes it quick and easy to import content, rip and burn CDs, create playlists, and sync to your device. Automatically import your existing music, pictures and videos, including music you have ripped into iTunes and Microsoft Windows Media Player, even transferring your existing song ratings in one easy step. Zune will automatically import unprotected .WMV, .MPG4 and H.264 files in your video library. Plug your Zune into your Xbox 360 console to listen to your favorite songs while playing your favorite games. 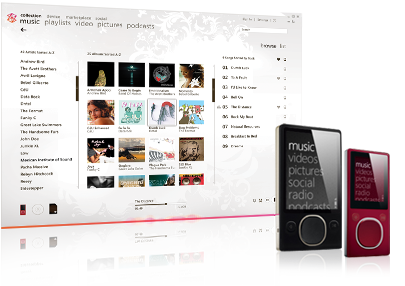 You can also stream the music, pictures and videos from the Zune software to your Xbox 360 console using a wireless connection. 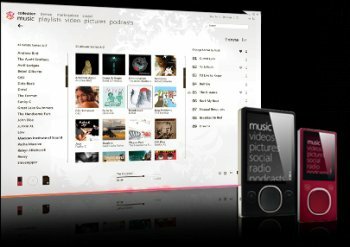 I don't have a portable Zune player , but I love this software it has a excellent, album art cover finder - editor- ripper,, best in it's class as far as I'm concerned, non bloat , just very well done period, It's like the developers gave it some thought!, It has become my default player period. Awesome software, really love the interface. Only two major downsides and what's keeping me from using the software is poor support for audio and video formats and when moving the player from one monitor to another the playing video will restart. Replaced WMP and Itunes after installing. Great for Music, ripping, podcasts and a fantastic Marketplace for Podcasts...This UI is now the defacto standard for all MS apps coming out next.. Tried this again. Nice interface and very usable but the memory resources are on par with iTunes > 120 megs to plays songs minimized. Nope, going back to aimp2 or xmplay. I'll have my HD as soon as UPS delivers it. But, to be prepared, I downloaded this software. It's not necessarily bloated. The setup package is a ZIP file that breaks down into many smaller programs. There are separate 32 and 64 bit setup packages in English, French, and Spanish. There's also a setup for .NET and numerous Windows updates, necessary to run the software. There's also a firmware upgrade for the device. I must add that I have been scouring the Internet for days to find a comprehensive, and not superficial review. I have yet to find one that told me other than the bare essentials that you can read in an ad on Best Buy or Amazon. How does the web browser work? What can you do with it? How easy it is to connect to your home wireless network? Can you synch or stream music from your home PC? What is the quality of reception of the HD radio? In response to all these reviewers, I don't really care about subscribing to some software store, as I already own 124 gig of music. I'm not looking for games or apps. I am buying the player to play the music I already own. I don't really care about the UI, as I tend to pick out some music, put the player in my pocket, and listen to the music. I don't care about constantly diddling with a UI or impressing other people with it. Excellent piece of software... Microsoft has a great developing team working on this one, it really shows. Thumbs up! still no 64-bit XP support.